In 2004, part of my childhood died. Such an inspiring opening… I was furious at the decision made to take Robot Wars off the air. Robot Wars was bordering on ‘unhealthy obsession’ ten years ago. All my pocket money was spent on the pullback replica robots; I watched the show live twice and fully decorated my room with yellow and black warning stripes and posters. Robot Wars was a huge part of my life. What hasn’t changed is that it still is… Every Friday evening was the same. BBC Two would go on at six in the evening for The Simpsons. That was followed by fifteen minutes of The Fresh Prince of Bel Air and was finally topped off by three-quarters of an hour of recycled appliances with minds of their own go at each other with ferocity of force 9 hurricane. The house robots Sergeant Bash, Matilda, Shunt, Sir Killalot, Dead Metal, Mr Psycho and Growler would patrol the battle arena as homemade robots tore each other to bits. It was superb, bloodthirsty, relentless and fantastic! I remember watching Hypno-Disc – A shiny machine with a huge flywheel – annihilate the weak armour of the lesser Stealth. I remember Chaos 2 effortlessly throw competitors around and out of the arena with its powerful flipper. I remember the elegant Razer finish off Bigger Brother in the series 5 final. Then after 6 Championships, 2 series of Extreme, various special events and World Championships, the BBC sold the rights to Channel 5. This was not a wise move. It was still Robot Wars been but the majority of the bigger names had gone, Phillipa Forrester had been replaced by Jayne Middlemiss and some of the finesse seemed to have been lost. But, it kept me happy. Jonathan Pierce still commentated on the brutalities with glee and Craig Charles still fronted the show; a new house robot had been included in the roster – Cassius Chrome – and it now ran for an hour. And then it didn’t. After one series on Channel 5, it was cancelled. Don’t think this is a nostalgic post about how much I miss Robot Wars because it isn’t. Robot Wars is still alive, kicking and screaming and last month, I got the chance to go see and relive the robo-carnage all over again! The rights to Robot Wars lie within Roaming Robots – a company that is responsible for putting on live shows and workshops for the general public. Bluewater’s Glow was big enough for the new arena. All the hazards were there; the pit, the floor flipper, flames and a new, bespoke house robot – Major Damage. It retained all of its appeal. This was proper Robot Wars with and underground edge. It did not disappoint. The auditorium was full and the lights dimmed when the countdown reached 00:00:00; the arena was set for the opening exhibition battle; the robots were waiting. The famous “3… 2… 1… ACTIVATE” bellowed out of the sound system and the warriors attacked. There was no holding back as robots flew through air, smashing and crashing into one another. Flames rose out of the floor and the audience cheered as metal slammed against metal. It was exactly how I remembered. These competitors were as persistent as ever; fighting back, unaffected by their short fly or harsh crash. 3 minutes on “CEASE” was called and the calm returned. The show featured an array of battles from the heavyweights which included Eruption with a stupidly powerful pneumatic flipper; the unique double flippers of Maelstrom; the sword wielding Saint and the German Luzifer. Not only that but previous all-stars Behemoth and fellow Lincolner, Stinger graced the arena to show their power and prowess to prove that they are still as destructive as they ever were made me smile. A melee of featherweights then entered the arena with a replica of the original Matilda. Watching tiny robots destroy each other with the savagery of the big boys was just as entertaining. It was a thoroughly enjoyable experience. I felt like a kid again; like Robot Wars had never gone. There was an air of pantomime behind it all that made it feel more engaging and the two presenters did a fantastic job of warming up the audience for every battle. Shouting ‘eezzay, eezzay, eezzay’ across the auditorium to the other half of the crowd every time our side won a battle was just good fun, just like what it was when I was part of the audience when it was being filmed. Having R2D2 come out in the interval was a nice surprise too although, having R2D2 fight Major Damage would have been a better surprise, but that’s just me. It was immense fun and for £16 a standard ticket (or £26 for a VIP ticket which includes a tour of the pits and the arena), a cheap thrill too. I have missed Robot Wars a lot since it was cancelled (to the point of being unable to function in day-to-day life) but what these people do setting up events that travel the country and the globe is not only phenomenal but inspiring and exciting all at once. Seeing people in the audience who had grown up with Robot Wars was fulfilling. Every seat in the house was sold that night. This shows that robot combat is a popular as ever and having the event organiser come out and asking whether we wanted the show back on TV to hear the tremendous chorus of yells and screams in agreement makes me believe that one day, Robot Wars will return. Maybe not the same as what it was but as long as there are people building these machines, there will always be people there to watch them wreck it up. Nestled away off the M20 outside of Maidstone lies Leeds Castle, described as ‘The Loveliest Castle in the World.’ Dating back to the 1100’s, the castle is shrouded in history. From Edward I to Henry VIII right up to Lady Bailey’s private ownership in the early 20th Century, this magnificent building has become one of Kent’s best and most attractive tourist attractions. We have been a few times – we’ll come to a reason why shortly – and have been impressed by its spectacle and grandeur. With its beautiful and vast five hundred acre gardens, moat and lake, it is impressionably quaint, especially around the spring and summer months when the flowers are in bloom and the resident peacocks are in feather. Around autumn, it evolves with the browns and oranges as the trees get ready for the cold, turning the once green foliage into a burning secret gem. What is magnificent is that it still holds a lot of charm no matter how the weather is. You can appreciate the best of the grounds even if it’s incredibly cold or blisteringly warm. As if the grotto wasn’t creepy enough! When you’ve had enough of the gardens (or indeed the rain) you can wander around the castle itself and learn all about its history. The walk past the water cascade to the gatehouse hits home that when you see the castle, you realise that this wasn’t built as a defence. There are no portholes or secret nooks for soldiers to hide in, battlements only look decorative, cannons don’t line the front garden, and the castle itself is not belligerent; this was purely built as a place to live. It just so happens to have a moat. With a choice of an audio tour or simply making your own way, you get to explore the majority of the rooms. Starting out in the wine cellars on the lower floors, you work your way up and around the grand building learning about its colourful history as a royal residence and under private ownership. Some of the rooms have encapsulated the Tudor splendor very well and the furniture, decorations and awnings have remained. Other rooms have a more modern décor from the turn of the 20th Century; with the bold colours and striking but simple lines. You make your way through into the different rooms, laid out in a labyrinth style, which is somewhat confusing if you don’t know where you’re going. This is an over-thought though as you do make you way through rooms such as master bedrooms and down corridors, peering into servant quarters, the music room, drawing room, the spectacular bathroom and various exhibition spaces. The grand marble staircase brings you to the end of the tour. The castle also features a courtyard; a magnificent spiral staircase made out of one large tree; period art works; historical artefacts and sizable library full of old books. 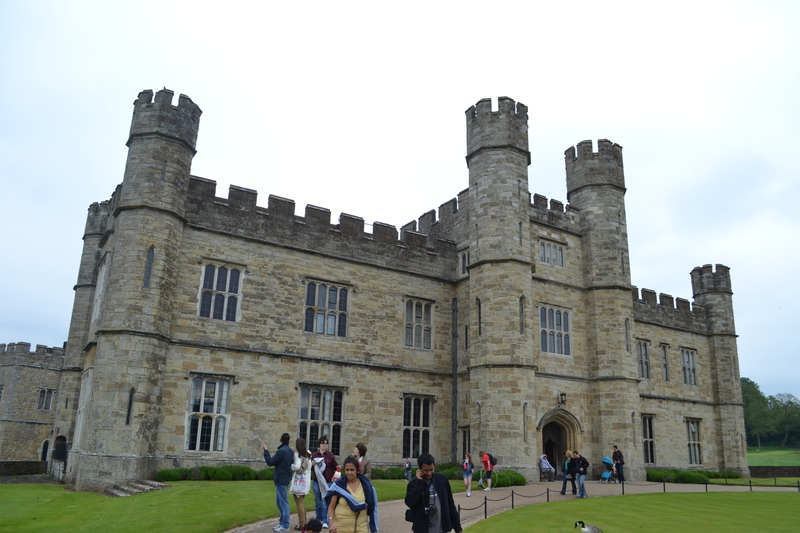 Although not as big or even as spectacular as some royal palaces, Leeds Castle is still an eye to behold. It’s quaint within its surroundings which suites it perfectly. Leeds Castle does also hold special events in its grounds. We visited during a St. George’s day festival and on a plot of land, overlooking the castle, an arena had been set out and various skilled recreationists took part in jousting challenges. Crowds gathered around, cheering and booing for their respective knights in shining armour; watching on in awe as they stormed down the track on horseback; charging at each other with lances, only to continue their battle on-foot with carefully choreographed swordfights. The castle has been known to hold special open air concerts, guided garden tours and photo walks, a supercar showcase, hot air balloon flights, fireworks displays and Christmas and New Year’s celebrations. These events are rather limited and can be somewhat quite pricey in their exclusivity but on the more down-to-earth front, there are regular occurrences that do take place also. If that’s your thing, you’re in luck! And once you need a break you have a choice of a Costa coffee café, the restaurant that serves hot food, a snack bar selling chips and the like or, our personal favourite, the ice cream parlour that sells delicious frozen Kentish diary treats! There are also a couple of souvenir shops that sell gifts such as personalised fridge magnets and key rings so you can immortalise your visit forever.